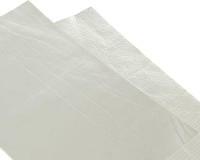 Self-adhesive, heat-protection film in various sizes and thicknesses. The film is made from a fiberglass mesh combined with a thin, reflective aluminium layer and is a must on all plastic areas on fairings or body work close to exhaust pipes. The film protects riding gear from temperatures up to 500°C.Simply hold the film up to the area to be covered and mark out the outline with a permanent marker. Finally, cut and apply. Simply select the desired thickness and size of film from the list and it will be shipped to you.